As I begin this prayer, God is present, breathing life into me and into everything around me. For a few moments, I remain silent, and become aware of God’s loving presence. Good Morning Jesus. First things first, I am thankful/grateful beyond words You’ve made it possible for me to be able to be in God’s presence. It is hard for me to imagine what You endured to make it possible for me. This paragraph has a great deal of importance to me since I’ve been my life/living has depended on God breathing in me. I have exceeded the life/living expectation of someone my age with pulmonary fibrosis. I am sure the medical profession will say it is the new medication I’ve been taking and no doubt that has helped, but the real credit goes to Jehovah-Jireh (the God who sees and provides). On different occasions I have prayed for a miracle healing and never received one, but what I received is a Divine Extension, one with no ending date! I will ask God’s help, to be free from my own preoccupations, to be open to God in this time of prayer, to come to know, love and serve God more. Jesus, I am a disciple/follower! It is my need/desire to Serve and Love You and the Father to my full capacity. My writing ministry as crude as it can be at times has become my primary way of doing so. The Glory Seeds and Blogs have become many things to me perhaps near the top of my list is one big reason for me to do all I can to ensure Your Gift of an extended life/living Glorifies You. Jesus/God I learned a long time ago leaning on my own strength/understanding is a downward path. Help me LORD, help me! Jesus, You are always there waiting for me. Grant that I may be still more often. That I may always desire to spend time in your presence. To know Your peace, Your love. Jesus the picture I have chosen to symbolize my Sacred Space is a picture of an empty bench. Yet You and I know it is never empty because the Holy Spirit who cannot be seen with the human eyes is there waiting for me 24/7. Of all the many different “things” the Holy Spirit it You’ve taught me that the Spirit is Your Presence and the Father’s Presence not only on earth and on that symbolic bench, but in my heart as well. There is NO Peace in the bench, the Peace I need and get is in Who sits there patiently waiting for. I long for The Bench 24/7. Should this fall on anyone else’s eyes I Hope/Pray they too have their own Sacred Place. Sometimes I wonder what I might say if I were to meet you in person Lord. I think I might say, “Thank You Lord” for always being there for me. I know with certainty there were times when you carried me, Lord. When it was through your strength I got through the dark times in my life. I know You’ve been carrying me since I exceeded my life/living expectancy! That adds up to about two and a half years! I know once I go my courage up enough to say, “Thank You,” I would then give You the biggest hug I’ve ever given anyone! As I look in life’s/living rearview mirror there have been many dark times, but now as I look into 2018 there is only Light, Your Light Jesus! It is my need/desire to reflect as much of that Light as possible! Jesus, I am weak You are strong! Since reacquainting myself with the Sacred Space Website my response to these Daily Prayers have been the catalyst I’ve needed for some time now. 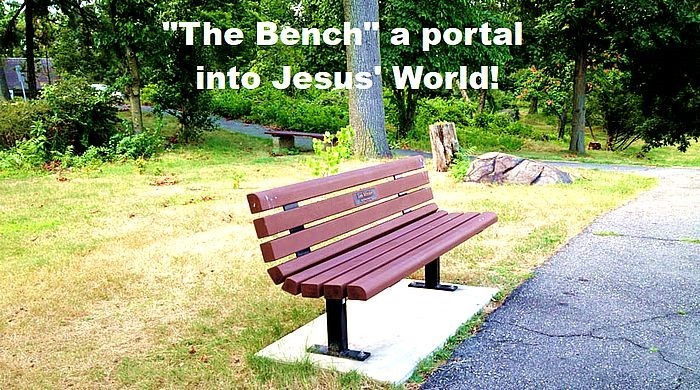 A couple of years ago when I was able ride my bicycle I would ride on a nearby nature trail and sit on a bench for awhile and connect not only with nature but You Jesus as well. It’s kinda neat the way those memories resurfaced again enabling me to take these verses to a deeper level. Thank You God. Thank You Jesus. Thank You Spirit! Check out Sacred Space for yourself.